Yesterday I had the wrong day of the week phenomenon. I thought it was Friday. I wanted it to be Friday. Sadly we all know it was Tuesday. For my meals, I planned the easiest day of eating. Breakfast was a Green Monster smoothie and a slice of the chocolate chocolate chip banana bread. I saved it just for Tuesday and it was the very last slice. Lunch was leftovers from Monday night. We had a Crock pot Thai chicken dish with noodles. I love it in the morning when my lunch is already packed and ready. I just need to grab the container. Dinner was also leftovers. These were from Sunday night. I made a huge Mexican Veggie Lasagna. We made some new guacamole and served with sour cream. Still super good the second time around. All in all I think this was one of the easiest days of eating. Now if only we could solve the dish problem. The dish fairy has yet to appear and clean out the sink. Double chocolate banana bread makes this classic a decadent breakfast or an irresistible dessert. You will never go back to the original after trying this chocolate version. And your better is your best"
Banana bread is a staple around our house whenever we manage to have extra bananas. The original is pretty darn good. Over the years I occasionally take that original recipe and add blueberries, chocolate chips, cinnamon chips and other yummy add ins making the recipe better in my mind. This weekend I took that recipe and upped the stakes even more with cocoa powder in addition to chocolate chips. That's double chocolate. It was such a simple change up but oh my goodness did it make this the Best. Banana. Bread. Ever. Seriously, you need to try it ASAP. I am a bit embarrassed that the whole loaf was gone in less than 48 hours. My grandpa was one smart man when he pushed up to always try harder and do better. This chocolate chocolate chip banana bread recipe is a great example of continuous improvement. Although I am not sure that is what he was getting at with his saying. Preheat your oven to 350°F. Spray a 9×5-inch loaf pan with a nonstick baking spray. Place baking soda, salt, flour and cocoa powder in a sifter or fine-mesh strainer. Set aside. In a bowl of a stand mixer cream butter with the sugar until light and creamy, about 2 minutes. Add egg, sour cream and vanilla. Mix until combined. Add dry to wet ingredients and mix on low until just combined. Fold in mini chocolate chips by hand. Leaving behind about 1 Tbsp. Place batter in loaf pan. Top with remaining mini chocolate chips. Bake for 45-55 minutes until middle is just set and a knife comes out clean. Cool in pan for 10 to 15 minutes, then run a knife around the edge and invert it out onto a cooling rack. Can you believe April is almost over? One this month flew by. Two it is still a bit cold for me to believe it is full blown Spring mode. Maybe May will just up the ante with temperatures. I cannot wait for all the trees and flowers to bloom. It being the end of the month and all means it is time for the Secret Recipe Club post. This month for the Secret Recipe Club I was given Karen's Kitchen Stories. She had wonderful, wonderful bread recipes but I was having some serious chocolate hankerings this month. 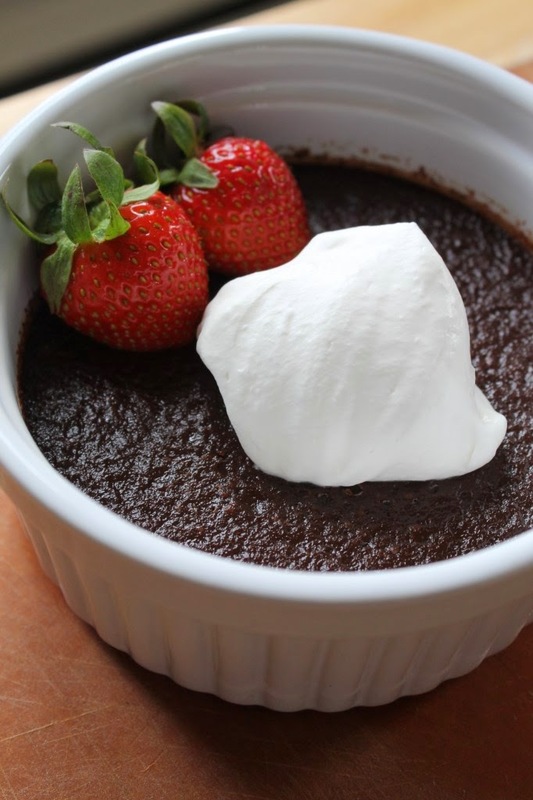 When I spotted the Chocolate Expresso Pots De Creme I knew I had to make them. Although this is a dessert I always enjoyed at restaurants, I had the notion that it was difficult to make and thus never attempted previous to this month. Maybe it is the whole water bath process? I am happy to say I was completely wrong in terms of difficulty. This recipe came together quickly you just need to be patient and keep a close eye on what you are doing. Burnt cream is no good. Neither is curdy eggs because you poured in the warm chocolate too fast. My husband and I shared the larger portion since I didn't have enough 2 1/2 inch ramekins from Karen's recipe. It was only problematic when it came to who got the last scoop of chocolate. In a 1 quart saucepan, bring the heavy cream and espresso to a boil, whisking constantly to dissolve the espresso. Remove the pan from the heat. Add the chocolate and whisk until all of the chocolate is fully combined. Set aside. Using a stand mixer, mix the egg yolks until broken completely. Add the sugar, vanilla, and salt and continue beating until well blended. Add one to two tablespoons of the chocolate mixture to the stand mixer with the mixer on low to temper the egg mixture. Slowly add the remaining chocolate mixture while mixing constantly to thoroughly blend the ingredients. If needed strain the mixture to remove any cooked egg pieces that might have formed. Pour batter into a two cup measuring cup. Divide the mixture evenly among ramekins. You will need 8 2 1/2 inch ramekins or 4 4 inch ramekins. Place the ramekins into a quarter sheet pan or a 2 quart casserole. Bring 2 to 3 cups of water to a boil. When the water is boiling, pour it into the baking pan so that it comes about half way up the sides of the ramekins. Cover the pan tightly with foil and carefully place it in the oven. Bake for 25 to 27 minutes, until the sides are done but the middle is still slightly soft. (If you use larger ramekins will will take a bit longer to cook. Remove from the water bath and cool on a cooling rack. Serve warm with whipped cream and strawberries. This weekend was all about chocolate and painting. Not that they go very well together but I managed to finally get around to painting our dining room. I couldn't decide on a color or two colors for the room so I kept putting it off. I finally went with BM Nelson Blue. It changes color depending on the time of day and the sun. It can be robin blue to a sea foam gray. I love it. (The picture doesn't do it justice at all.) Mr. J loves that now is can start his bar cart collection of alcohol. Knowing that the painting was going to take up most of my day on Saturday, I decided on date night for the evening. Date night = no cooking, no dishes. We went to our favorite restaurant on the town green. They just changed up the menu for the Spring time. I got an arugula salad and the hanger steak with Brussels sprouts and sweet potato hash. It was so good. Before the painting got started I decided to get some motivation from this chocolate banana bread. 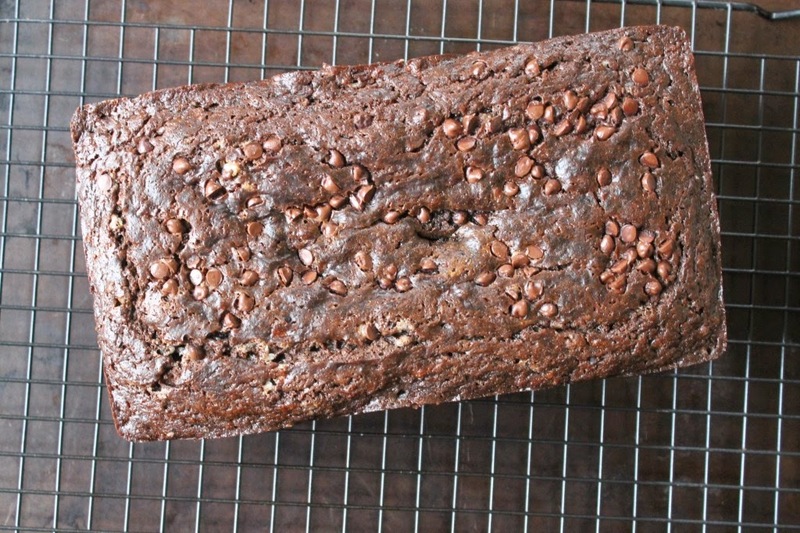 Have you ever had chocolate banana bread? This was my first and let me tell you it is good. So good! That was my weekend and boy did it go by fast. What were you up to? I am not a potato lover per se but every once in a while nothing sounds better. Normally this happens when said potatoes are jazzed up with extra seasonings or cheese. For Easter I got to craving scalloped potatoes after seeing tons and tons of Pinterest posts. I couldn't help myself. When I suggested a cheesy version for Easter dinner Mr. J was in. We always grew up with scalloped potatoes but they were the box version. In fact when I first think of scalloped potatoes a picture of a red box pops into my head. These are not those kind of potatoes. These come together very quickly as soon as you take the time to slice the potatoes as thin as possible. Then you just layer the rich ingredients and like the potatoes do their thing in the oven. 30 old minutes later you have have a decadent dish of creamy, cheesy potatoes that melt in your mouth. In a oven safe deep saute pan, lightly oil bottom of pan and heat on medium. Add onions and cook until just soft and then add garlic. Cook for another minutes. Combine heavy cream, garlic, thyme and nutmeg and add to pan for about 1-2 minutes until heated through. In two or three batches, add a layer of potatoes to prepared baking dish in an overlapping pattern; season with salt and pepper. Use 1/3 of the cheddar and Gruyere cheese mixture to top each layer of potatoes. Repeat with remaining potato slices and cheese. Gently push down on the potatoes so they are almost completely covered with the cream. Top with Parmesan cheese and additional salt and pepper to taste. Bake potatoes until bubbly and the top begins to brown, 25-30 minutes, or until top becomes golden brown and crusted. Remove from the oven and let sit for 10 minutes. Serve warm. This month for Pass the Cook Book Club, Erin from The Spiffy Cookie choose Breakfast for Dinner by Lindsay Landis and Taylor Hackbarth of Love and Olive Oil. 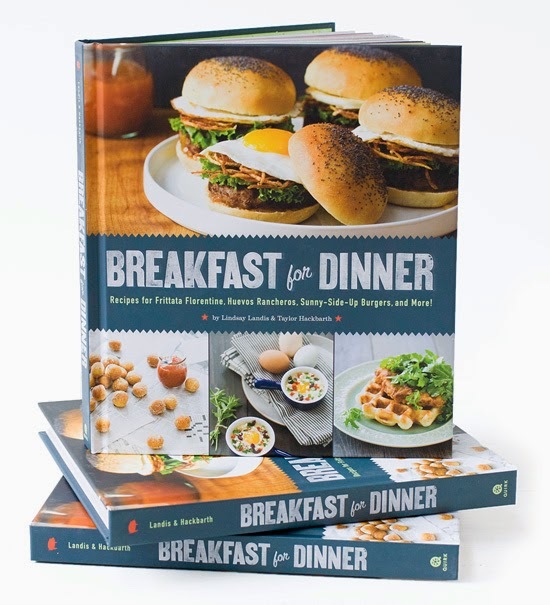 As an extra fun bonus, we will also be hosting a giveaway for three readers to win a copy of the cookbook! If case you are new to the game, each month Pass the Cook Book Club picks three recipes from a cookbook that has been sitting on the shelf for a bit too long. Each person chooses one of the recipes to make and we all post together. For me, breakfast for dinner is something quick and simple I decide to have when I didn't plan a meal or don't feel like really cooking. This recipe was not that kind of breakfast for dinner. There were multiple pieces and steps; the whole thing was pretty lengthy. We choose do make this a weekend project together. I haven't made homemade pasta dough before and I think I need a roller or maybe I just didn't have the strength and endurance to get them thin enough by hand. My raviolis came out huge - each of us had two. Overall this dish was fantastic. It was fun to make the homemade pasta dough. The filling had great flavor and the white sauce was super rich but not too much. The whole thing just melts in your mouth. The downer was the time commitment to putting it all together. I think we started to late and the hunger got to us about half way through the process. I think you could make the different parts (pasta dough and filling) ahead time so it is not so involved all at once. But that being said the recipe is written to use the same pans over again at different times in the recipe so it definitely helps to do it all at once. Now for the giveaway! It is open to all residents of the US and Canada and will close May 1st. Good luck! In a large bowl, combine the flour and salt. Make a well in the center, add eggs and lightly beat with a fork. Gradually incorporate the flour. Knead by hand or with your stand mixer’s dough hook. Add more flour or water as needed, 1 teaspoon at a time, to form a firm dough. Knead by hand on a lightly floured surface for another 1-2 minutes or until smooth. Divide into quarters and wrap tightly with plastic wrap and let rest for 30 minutes before rolling out by hand or with a pasta roller. In a large pot, bring salted water to a boil. Add potatoes and cook for 5-7 minutes, or until tender. With a slotted spoon, transfer to a large bowl. Smash well and stir in ricotta cheese. Set pot aside. In a large skillet over medium heat, cook the bacon until it starts to brown, about 2-3 minutes. Add pork, crumble, and cook for 2 minutes. Stir in brown sugar and spices and cook for 6 minutes or until the pork begins to brown. Add to the potato mixture and stir to incorporate. Add salt and pepper to taste. Set skillet aside. For the ravioli: Roll each ball of dough into thin sheets. Lay 1 sheet on a lightly floured surface. Place teaspoons of filling an inch apart over the entire sheet. Brush water in the spaces between the filling. Lay another sheet of dough over the first and press around filling to seal. Cut into square with pastry wheel. In the same large pot from earlier, bring salted water to a boil. Working in batches, boil ravioli for 7-8 minutes, or until tender. Transfer with a slotted spoon to serving dishes and reserve ¼ cup pasta water. Place skillet with bacon and pork drippings over medium heat. Add wine and simmer for 2 minutes, scraping the brown bits from the bottom of the pan. Add cream, butter, and sage. Simmer until thickened slightly, about 3-5 minutes, whisking constantly. If needed, add reserved pasta water until sauce is the consistency of thick cream. Spoon over ravioli and top with Parmesan. I needed to be in Indiana again this week. Unlike last time when the freak snow storm canceled my flight, I actually made it this time. It was a balmy 70 degrees when we landed and the trees were in bloom. Breakfast at this hotel was pretty bad. The omelet was greasy, they only had not ripe cantaloupe, and the biscuits were hard. I was really dumbfounded as to how the biscuits had rocks in them. This little meal was promptly followed with a trip to Starbucks. Lattes make everything better. We had a quick break for lunch. Instead of trying to find somewhere local we just hopped into Moe's. It was right next door and had plenty of parking. Rental cars always throw me off since they are different sizes than what I am used to. When you add parallel parking in to the mix it is quite the scene. I try to avoid it at all costs, even if that means a less than stellar meal. Dinner was at Harry and Izzy's in the airport. This restaurant is in downtown Indy and quite fancy. The one at the airport is much more causal. I got the trio special which was shrimp cocktail, Caesar salad and two sliders. Everything was pretty good. The cocktail sauce was so spicy. I love horseradish but this was a bit much. I was totally in tears after the first bite. I am back in Connecticut now for a bit and ready to make some good homemade dinners. I have a three for one today. 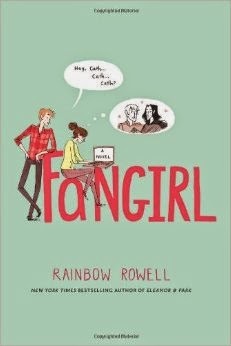 A few weeks ago I was told about a new author, Rainbow Rowell, that had some good, fun books. 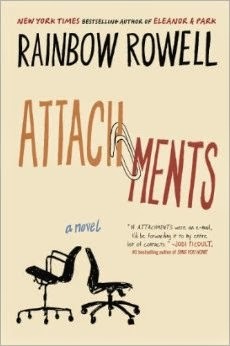 Of course with the name Rainbow I don't know how you could have anything but good, fun books. I am up for good and fun anytime so I quickly reserved the three at my local library. There are times when I do this and the books come so slowly; I wait weeks. This time around though they came within a couple days and they all came at once. Lucky for me (I think?) I had several work trips lined up and I got to bring these along for the ride. 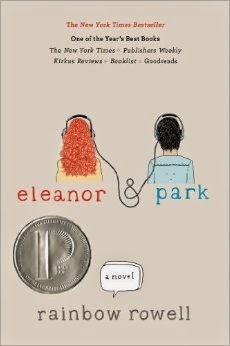 The first up is Eleanor and Park. This novel is about two outsiders over the course of one year of high school. They unwantingly meet on the bus and the rest is history. This book is about the good things in life and the bad as soon through the eyes of two high school kids. From beginning to end you don't know where the story is going to go as it is told by the perspective of both Eleanor and Park. Next is Fangirl. The main character here is Cath. Cath is a Simon Snow fan, a series similar to the Harry Potter novels. Her whole life is Simon Snow. Becoming an ultra fan helped her and her twin sister get through the tough times of their mother leaving. Now her sister is ready to move on and become her own person at college. Cath wants things to stay the same. She suddenly finds herself in her freshman year of college, a new roommate and not knowing what to do with herself. Finally Attachments. Lincoln is a nighttime Internet security officer charged with weeding out all things unnecessary or pornographic in company emails. He is supposed to spend each evening reading through flagged emails. Not really liking his job, most of the time he just deletes the emails and moves on. However, he gets hooked on the correspondences of Beth and Jennifer. They are funny, witty and real. He starts to think of them as his friends. Knowing this is strange he starts to assess his own life. Where he was with his high school romance, why he is stilling living at home with his mom, and who he wants to become. You get to know all three of these characters through Attachments. There are several twists and turns before the novel ends. 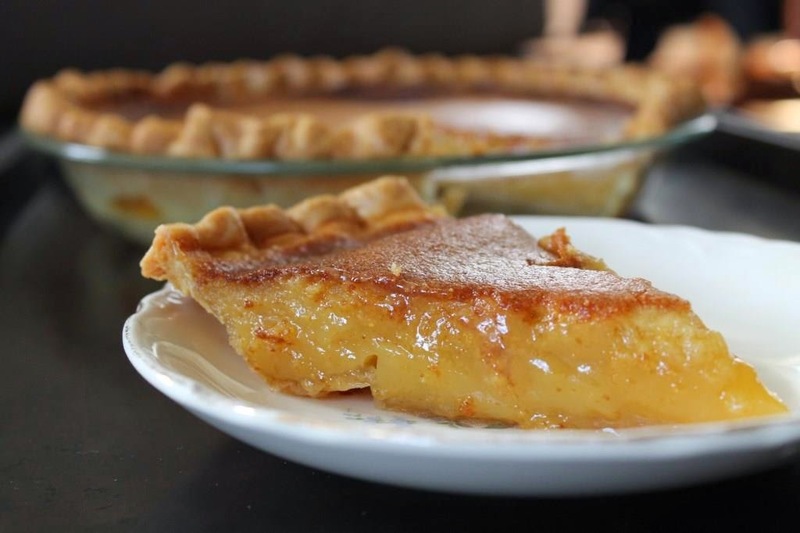 A deliciously sweet, smooth and creamy pie packed full of honey and butter flavor. I hope you had a marvelous Easter weekend. Mr. J and I were pretty low key and enjoyed the lovely spring weather. I made this pie for Easter dinner. It is from the Four and Twenty Blackbird Pie book I got for Christmas. I have been eying this pie all winter and decided the Salty Honey Pie would be perfect for Easter dessert. It was so perfect that 2 slices were promptly missing one day before Easter. It almost killed Mr. J to wait the three hour cool time once the baking was done. He had to leave the house. Seriously. I am not a big pie fan. And this doesn't even have chocolate in it but I am telling you this is one fantastic pie. If you like honey at all, you must try this out. After the whole crust making the filling is simple to put together. The tricky part is pulling the oven out before it gets too dark and burns. I think I got ours just in the nick of time even though the filling was still kind of juicy when I removed it from the oven. It firmed up nicely once cooled. In a medium bowl, whisk together flour, sugar, and salt. Add cold, cubed butter and, using your fingers (or a potato masher), work the butter into the flour mixture. Quickly break the butter down into the flour mixture, some butter pieces will be the size of oat flakes, some will be the size of peas. Create a well in the mixture and pour in the cold buttermilk. Use a fork to bring to dough together. Try to moisten all of the flour bits. Add a bit more buttermilk if necessary, but you want to mixture to be shaggy and not outwardly wet. In a medium bowl whisk together melted butter, sugar, cornmeal, and salt. Add the vanilla extract into the butter mixture and whisk until thoroughly combined. Whisk in honey. It seems like the weekend just started and now it is coming to a close. I hope everyone is able to enjoy Easter and all things that come with this special day. In high school I worked at an organic farm store. It actually was the first certified dairy farm in Maine. I didn't really work on the farm; I spent most of my time in the food store and bakery. Once a week we would make biscuits. I wouldn't describe myself as a biscuit lover. In fact whenever we visit Cracker Barrel and they bring biscuits and corn bread I always pick the corn bread. I think my weekly biscuits fix in high school carried me through for quite a while until now. For the last two weeks I couldn't get biscuits out of my head. Finally I decided there was no use waiting any longer. Biscuits were a must. Mr. J was more than happy when he walked in the door and found this tray on the oven. I only baked off six last weekend since we were both going to be gone this week. The rest were cut and frozen for the next time I get the biscuit craving. I enjoy my biscuits with a dab of butter, honey or peanut butter. 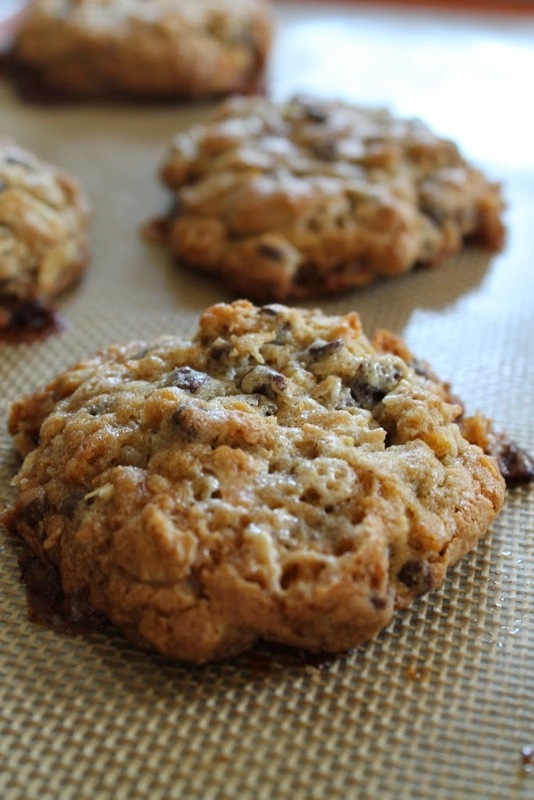 They are best warm, right out of the oven when any topping melts right into the flaky biscuit. Those frozen biscuits might be making an appearance soon than expected. Heat oven to 400 °F and cover baking sheet with parchment paper. Whisk flour, sugar, baking powder, salt and baking soda in large, wide bowl. Using a pastry blender, work butter into dry ingredients until the mixture resembles a coarse meal. Transfer dough to floured counter and pat out until 1/2 to 3/4-inch thick. Using a round cutter (2 or 3 inches depending on the size you desire), press straight down — twisting produces less layered sides — and transfer rounds to prepared sheet, spacing two inches apart. Bake until biscuits are golden brown on top, about 10 to 12 minutes. Cool slightly, then serve warm. 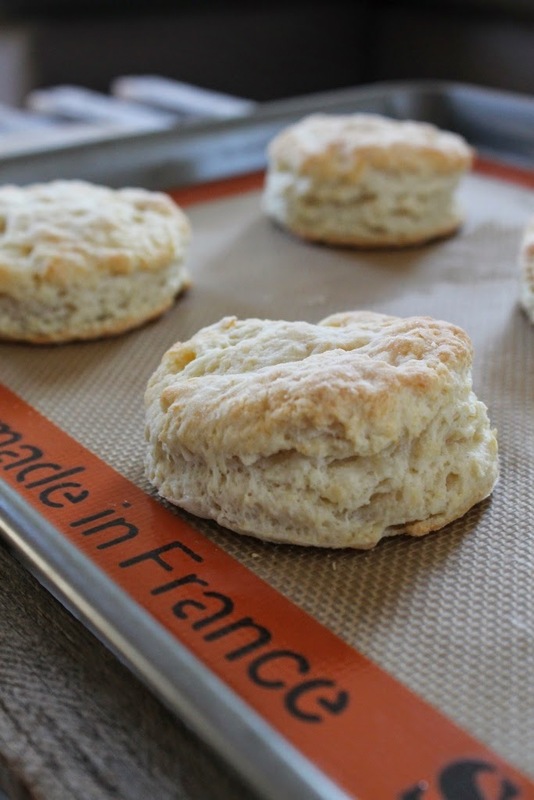 Non-baked biscuits can be frozen for later once cut into rounds.